U Yetkin, ? Yürekli, A Gürbüz. Extracranial Internal Carotid Artery Aneurysms. The Internet Journal of Thoracic and Cardiovascular Surgery. 2006 Volume 10 Number 2. Aneurysms of the extracranial internal carotid artery are extremely rare. They have technical disturbances,different etiologies,varying diagnostic and curative approaches therefore internal carotid artery aneurysms are interesting and also infrequent cases. They can cause life threatining complications. Open surgery has been the primary mode of treatment and its results have been satisfactory fort he long term survival. The endovascular approach offers advantages in other situations where open access to the distal extent of the aneurysm is difficult or condition leads to concerns about wound healing. A mass appearing at carotid region (poststyloid parapharyngeal area) can be either of neurogenic, vascular or lymphatic origin (1). The aneurysms of extracranial internal carotid arteries (AEICA) are seen rarely, but since they may cause thromboembolic complications leading to stroke they deserve special attention in differential diagnosis of lesions at carotid region (2). AEICA are divided into 2 categories as true- and pseudoaneurysms (3). Since the clinical findings and treatment modalities may depend on the type, dimensions and localization of the aneurysm; extracranial lesions should be evaluated separately. In order to talk about true aneurysms, the diameter of the vessel expand at least 50% that is possible even with a tiny dilation of internal carotid artery (2). Surgical approach is preferred to medical therapy due to complications such as stroke due to thromboembolism, rupture, cranial nerve injury originating from large aneurysms (4). 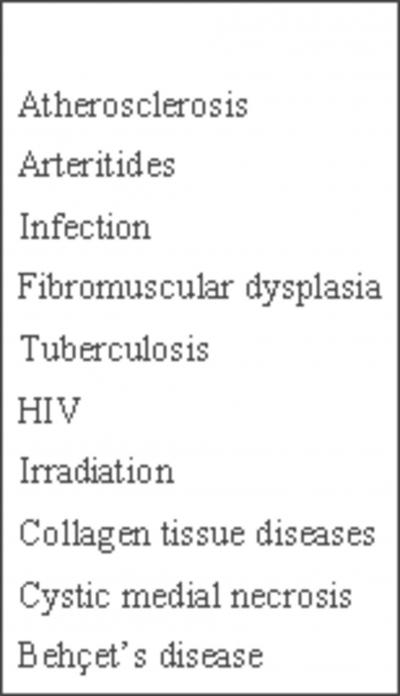 Most common etiological factor for AEICA is atherosclerosis with an incidence of 34 to 70% in different series. In most of the true carotid artery aneurysms, atherosclerosis serves for a secondary finding rather than a primary cause. They are typically fusiform in shape although saccular aneurysms are also seen (3). Severe hypertension is commonly seen (6). AEICA is dilation of ICA more than 50% of its normal diameter that is 0.55±0.66 centimeters in male and 0.49±0.07 centimers in female. Patients are usually younger if the underlying cause is not atherosclerosis where the possible diagnoses are tuberculosis, HIV or Takayasu arteritis. Salmonella and syphilis are the main causes of mycotic aneurysms. Fibromuscular dysplasia, collagen tissue disorders and irradiation are among the rare causes of AEICA. Aneurysms of atherosclerotic origin are mostly seen over the age of 50 and carry the high risk for thromboembolic stroke while located at proximal ICA. The rupture risk is high in mycotic carotid aneurysms whereas traumatic ones tend to stabilize and show regression (3,7,9,10)(Table 1). Extracranial true carotid artery aneurysms are seen twice as common in males and mean age is around sixties at the time of diagnosis .Their prevalence is around 0.1 to 3.7% even at the major centers where all the interventions regarding carotid artery may be carried out which shows that they are seen rarely (3,5). When compared to all the peripheral arterial aneurysms, the incidence of carotid artery aneurysms is 0.4 to 4% (3,5,11,) Welling and his colleagues reported that extracranial carotid artery aneurysms constitute only 41 out of all 1118 peripheral arterial aneurysms defined in a period of 30 years (11). The natural prognosis of the true carotid artery aneurysms is well expected.. Most of these aneurysms are asymptomatic (2,3). Central nervous system dysfunction (transient ischemic attack or stroke) is the most common finding at admission (3). In 37.5 to 100% of cases the first finding is of neurologic origin (3,5,12). The principle etiology for neurologic accidents is embolization from the aneurysmal contents. Among the patients of published literature, 60% experienced transient ischemic attack (33% amaurousis, 21% hemispheric) or obvious stroke (8%) (2). In physical examination 90% of cases possess pulsatile mass around neck region (3,6,12)(Table 2). Spontaneous rupture or bleeding are very rare but fatal complications seen particularly in cases with mycotic aneurysms developing due to peritonsillary or middle ear infections (2,3,13). Early diagnosis and anatomical characteristics of the aneurysms are important in terms of both surgical and endovascular treatments. Ultrasound imaging is initially useful for cases with palpable pulsatile mass at neck region (3). It serves for determination of the size and extension of the aneurysm (2). Although ultrasound is a valuable diagnostic tool for definition of anechoic structure and pulsation of the aneurysm, it may become insufficient in defining thrombosed aneurysm and relation of the aneurysm with its neighboring structures (14). In diagnosing and characterizing the aneurysms, DSA is the gold standard imaging method (15). But, since DSA is an invasive method, persistant neurological complications develop in 0.5% of cases (16). Although arteriography is a method leading to definitive diagnosis,showing only the patent lumen is its disadvantage. Therefore, recently noninvasive or minimally invasive methods are more popular to demonstrate the aneurysms. In contrast CT imaging , the lumen and wall of the aneurysm show identical contrasting as vessels. Thrombosed segments appear as hypodense areas that are not contrasted. Calcification in its wall is important in diagnosis. When ultrasound and contrast CT imaging are evaluated together, the possibility of misdiagnosis disappears. It is pathognomonic for an aneurysm to show a patent lumen with a cystic ultrasound image as densely contrasted in CT. Thrombus material shows hyperechoic images in ultrasound whereas they appear as portions that are not contrasted in CT (14). 3D (dimensions)-CT angiography have advantages such as easy and rapid applicability, being a minimally invasive method, having no manifest complication besides contrast medium allergy, capability of rotating the images 360° (15,17) The most important advantage of CT angiography is its capability of evaluating images on preferred planes and angles on the screen. Therefore, superimposed vessel images in DSA making it hard to evaluate are easily evaluated with CT angiographyMoreover, capability of rotating the CT angiographic images on preferred planes and angles helps the surgeon in orientation to approach the aneurysm (15,18). CT angiography have certain limitations. Differentiation of small aneurysms from neighboring bones is not possible each time. CT angiography is not capable of showing the collateral circulation as seen in DSA (15, 18, 19). Both arteries and veins are visible in CT angiography and it is not easy to differentiate either of them. Arteries less than 1 mm in diameter such as anterior choroidal artery and thalamoperforating arteries are not visible. Magnetic resonance angiography (MRA) is a non-invasive method that can visualize vascular structures without a need for contrast medium or X-ray (15). MRA can manifest the thrombosed portions of aneurysms, residual lumina and flow characteristics (14). In standard spin-echoMR images, slow or turbulent flow in a patent vessel can create signals mimicking thrombus falsely (20). This is due to more heterogenous image of turbulent flow and thrombosis whereas patent lumen shows high velocity signal loss (1). MRA is particularly useful in suspicion of carotid artery dissection due to its characteristic of detecting the old blood in dissected area (3). MRA and 3D CTA mainly replaced the conventional angiography at many centers. Promiment factors that emphasize superiority of MRA to arteriography are that it is cheaper, it excludes the risk of stroke associated with angiography and it gives information about the surrounding tissues (3). MRA also provides reconstruction and rotation of images of intracranial circulation and evaluation of collateral circulation better than arteriography (3). Recently, at vascular system of head and neck region MRA is used most effectively in imaging extracranial carotid arteries (14)(Figure 1). Particularly, thrombosed aneurysms may be confused with tumors of this area and parapharengeal abscesses. Therefore, surgical interventions without definitive diagnosis may result in adverse events (14). In masses of head and neck region, a complete radiological evaluation is necessary before any surgical intervention. 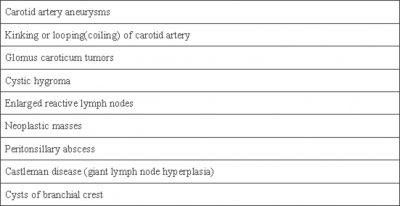 Looping or kinking of carotid arteries are the conditions mostly confused with carotid artery aneurysms (3)(Table 2). Kinked carotid artery is more commonly seen than carotid artery aneurysms, mostly in hypertensive females and particularly on the right. To differentiate these two entities during physical examination, patient is told to take a deep breath and hold. In kinked carotid artery, pulsation disappears whereas it still continues in aneurysm. Evaluation of pulsatile mass by physical examination can lead to differential diagnosis of tortiosity (3). In aneurysm, pulsation radiates laterally whereas in kinking of carotid artery ,on the contrary, pulsation propagates through the long axis of the vessel (3,21). In glomus caroticum tumors, there are also painless mass and pulsation due to its closeness to carotid artery. In these patients, the mass lesion is laterally mobile whereas fixed vertically (3). MRA especially differentiates carotid artery aneurysms from kinking or extensive looping (2,15). First successful surgical intervention to extracranial carotid artery aneurysm had been carried out by Sir Astley Cooper in 1808. He had ligated the painful and bulbous internal carotid artery proximally during the intervention (3). Ligation constituted the base of therapy until 1950s but the incidence of neurological complication increased with this method. In 1952, Dimtra performed resection and end-to-end anastomosis technique (5,9,22). In 1970s, reconstruction of the carotid arterial system became standard treatment modality. Purpose of treatment is total exclusion of aneurysm from circulation, removal of mass effect and preservation of blood flow in main arterial circulation (23,24). If the mass effect of the aneurysm exists, it should be relieved (23). In these cases, age of patient, size of aneurysm, anatomical structure of arteries, response of patient to carotid occlusion, experience of the clinic on vascular surgery and technical facilities should all be taken into account (23). In literature, extracranial internal carotid artery aneurysms constitute 0.1 to 2% of all carotid arterial interventions (5,9,10). In a study covering a period from 1960 to 1995, among 67 (0.9%) out of 7394 aortic and peripheral aneurysms were reported as internal carotid artery aneurysms (5). If aneurysmatic dilation constitutes more than or equal to 200% of diameter of internal carotid artery, surgical therspy is commonly preferred (25). Symptomatic patients with cerebral ischemia or local findings should be treated surgically. Surgical approach to asymptomatic atherosclerotic carotid artery aneurysms is controversial. But, incidence of stroke among patients with carotid artery aneurysm remaining untreated is over 50%, therefore, surgical therapy is recommended in acceptable risk group (3,13). Furthermore, natural course of internal carotid artery aneurysms remains still unclear where mortality rate is 16 to 71% among patients that are not operated (5,9). But, while planning the surgical procedure one should consider factors such as proximal and distal diameters, size and etiology of aneurysm with condition of contralateral carotid artery and collateral flow originating from posterior circulation (3). In some cases, particularly of mycotic etiology, if distal control cannot be established, primary ligation of the vessel should be done. 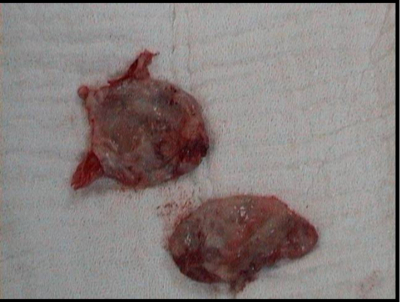 Ligation is also carried out in cases with uncontrolled bleeding. Although ligation prevents expansion of aneurysm and embolic complications, it is only spared for cases inconvenient for reconstruction and used only in 10% of cases, recently. With this technique, mortality/major stroke rate is around 12% (9). This rate may vary regarding clamped carotid artery pressure. If the retrograde pressure is less than 60 mmHg, extra- or intracranial bypass should be planned (5,7,9). In about 90% of the true carotid artery aneurysms, aneurysmectomy and ipsilateral carotid to carotid graft interposition are applied (2)(Figures 2 and 3). Figure 2: Perioperative exploration of giant fusiform aneurysm operated in our clinic. Figure 3: Extirpated aneurysm material of our case of giant fusiform ICA aneurysmectomy. Mostly applied method is use of proximal great saphenous vein as venous conduit (2,3). Nevertheless, there are various experiences reported in literature against use of this venous graft regarding its high incidence of postoperative dilation and stenosis (26,27). For the same purpose, Dacron or polytetrafluoroethylene (PTFE) grafts are also preferred. But these grafts also possess risk of late stenosis secondary to intimal hyperplasia (26). It should also be considered that in 50% of cases with vascular prosthesis, infection can be detected on the suture line. The surgical treatment of aneurysms that are large and involve distal internal carotid artery is technically difficult (26). For optimal exploration of upper end of ICA, techniques such as division of vertical arm of the mandible and anterior subluxation of mandible may be used (26). In saccular aneurysms, since distal carotid artery shows adequate elongation, end-to-end primary anastomosis of ICA can be carried out (2,26). In cases where CCA remains free of aneurysmal degeneration, ECA can be used as proximally transposed portion alternatively (3). This procedure of reconstruction can be carried out without using a shunt if there isn't any preexisting stroke or a defect in collateral cerebral circulation. Due to a prolonged oclusion time, most surgeons prefer to use shunts (26). In some cases it is difficult to build a shunt and distal embolization may occur as a complication. Therefore, shunts may not be used in cases where there is no occlusive lesion detected arteriographically on contralateral side and no significant changes occur during proximal arterial clamping in electroencephalographic monitoring and/or cerebral blood flow measurements (26,28). Stroke and cranial nerve injuries are potential risks for surgical treatment of aneurysms with a diameter of more than 3 cm and/or extending to the skull base (26). Problems associated with traction of cranial nerves –particularly XIIth cranial nerve- and distal embolization of atherosclerotic debris explain these risks. Again, hypertension of neurologic form may develop if nerve to carotid sinus is injured while contralateral sinus or aortic baroreceptors are inactive (2). Mortality of aneurysmectomy and arterial reconstruction is less than 2%. Incidence of stroke is reported as 6% (2,29). Endovascular treatment may be used also in appropriate cases as an alternative to surgical therapy (23). But in these cases indications of endovascular surgery are limited. If the possibility of cranial nerve injury is high during tissue resection or aneurysm extends into skull base and distal control is difficult as in large aneurysms, endovascular therapy steps forward (3). Endovascular treatment is preferred since there is no cranial nerve injury, it is capable of treating lesions that are hard to reach surgically and there is no need for general anaesthesia (3). Nevertheless, reason for preferring endovascular treatment in aneurysms occurring due to radiotherapy that extend into skull base is that surgical therapy carries high risk of nerve injury. But in giant aneurysms, possibility of rupture during the procedure, incomplete obliteration of aneurysm, high incidence of distal thromboemboli and inability to relieve the mass effect make endovascular treatment possible only if there is a contraindication to surgical therapy (23). Moreover, ability to empty the thrombus and remove the mass effect via excision of aneurysm show that surgical therapy is effective and reliable. AIECA are really rare disorders that should be kept in mind in differential diagnosis of tender pulsatile neck mass. These patients may have complaints such as dysphagia, headache and neck pain, feeling of retroorbital pressure, otalgia and cerbrovascular symptoms. Among the major complications are local mass effect, distal embolization and arteriovenous fistula formation. Early diagnosis and treatment are of great significance since cerebrovascular complications and death are seen in 50 to 70 percent of cases. Although Color Doppler ultrasound and contrast CT are important in definitive diagnosis, MR angiography or arteriography are necessary in planning the surgical strategy. Satisfactory results of the surgical approach supports aggressive therapy. 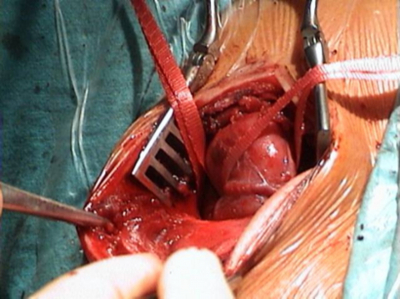 Exposure of distal ICA while sparing neighboring structures and protecting arterial continuity establish principles of surgical technique. 1. Türkvatan A,Kelahmet E,Ölçer T.İnternal Karotid Arter Psödoanevrizmasında Radyolojik Bulgular.Ankara Üniversitesi Tıp Fakültesi Mecmuası 2003;56:193-6. 2. Moreau D,Albat B,Thevenet A.Surgical treatment of internal carotid artery aneurysms.Ann Vasc Surg 1994;8:409-16. 3. Longo GM,Kibbe MR. Aneurysms of the carotid artery.Semin Vasc Surg. 2005;18(4):178-83.(Review). 4. Balcı AE,Çakır O,Eren S. ve ark.Psödoanevrizmalarda Tanı veTedavi.Türk Göğüs Kalp Damar Cerrahisi Dergisi 1999;7:324-7. 5. 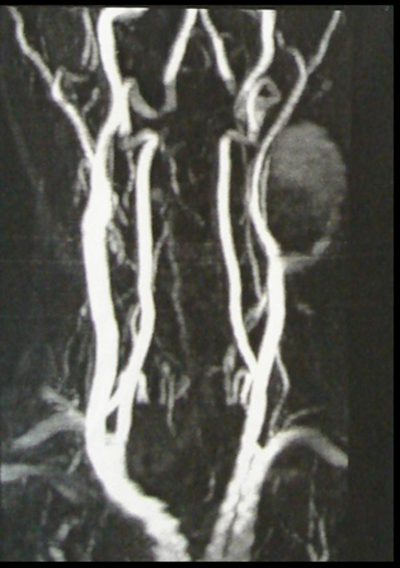 El-Sabrout R,Cooley DA.Extracranial carotid artery aneurysms:Texas Heart ınstitute experience.J Vasc Surg 2000;31:701-12. 6. Miksic K,Flis V,Kosir G et al.Surgical aspects of fusiform and saccular extracranial carotid artery aneurysms.Cardiovasc Surg 1997;5:190-5. 7. Rosset E,Albertini JN,Mangan PE,Ede B,Thomassin JM,Branchereau A.Surgical treatment of extracranial internal carotid aneurysm.J Vasc Surg 2000;31:713-23. 8. Nair R,Robbs JV,Naidoo NG.Spontaneous carotid artery aneurysms.Br J Surg 2000;87:186-190. 9. İşcan HZ,Kunt A,Hızarcı M,Bayazıt M.Ekstrakraniyal İnternal Karotis Arter Anevrizmaları.Damar Cer Derg 2003;12(1):43-7. 10. Mansuroğlu D,Kırali K,Şişmanoğlu M,ve ark.İnternal Karotid Arter Anevrizması:Olgu Sunumu.Damar Cer Derg 2001;2:87-9. 11. Welling RE,Taha A,Goel T et al.Extracranial carotid artery aneurysms.Surgery 1983;93:319-23. 12. Zhang Q,Duan ZQ,Xin SJ,et al.Management of extracranial carotid artery aneurysms:17 years' experience.Eur J Vasc Endovasc Surg 1999;18:162-5. 13. Hertzer NR.Extracranial carotid aneurysms:A new look at an old problem.J Vasc Surg 2000;31:823-5. 14. Akan H,Selçuk MB,İncesu L,Güneş M,Tekat A.Servikal İnternalKarotid Arter Anevrizması:Radyolojik Değerlendirme.Türk Otolarengoloji Arşivi 1997;35:111-114. 15. Ahmetoğlu A,Koşucu P,Dinç H,Sarı A,Kuzeyli K,Gümele HR.Serebral Anevrizmaların Tanı ve Karakterizasyonunda Multi-Slice BT Anjiyografi.Türk Tanısal ve Girişimsel Radyoloji Dergisi 2003;9:302-8. 16. Heiserman JE, Dean BL, Hodak JA, et al. Neurologic complications of cerebral angiography. AJNR 1994; 15:1401-11. 17. Matsumoto M, Sato M, Nakano M, et al. Three-dimensional computerized tomography angiography-guided surgery of acutely ruptured cerebral aneurysms. J Neurosurg 2001; 94:718-727. 18. Matsumoto M, Satoh N, Kobayashi T, et al. Helical CT for emergency patients with cerebrovascular disease- diagnosis of cerebral aneurysms with subarachnoid hemorrhage (SAH) by three-dimensional CT angiography (3D-CTA). Surg Cerebral Stroke 1996; 24:177-185. 19. Villablanca JP, Martin N, Jahan R, et al. Volume rendered helical computerized tomography angiography in the detection and characterisation of intracranial aneurysms. J Neurosurg 2000; 93:254-64. 20. Weissman JL,Johnson JT,Synderman CH,Seed DL.Thrombosed aneurysm of the cervical carotid artery:avoiding a retrospective diagnosis.Radiology 1994;190:869-71. 21. Bergan JJ,Hoehn JG.Evanescent cervical pseudoaneurysms.Ann Surg 1965;162:213-17. 22. Sokullu O,Şerbetçioğlu A,Sanioğlu S,Kurç E,Enç Y,Bilgen F.Ekstrakraniyal İnternal Karotis Arter Anevrizması:İki Olgu Sunumu. Türk Göğüs Kalp Damar Cerrahisi Dergisi 2002;10:181-3. 23. Tekiner A,Bayar MA,Çelik H, ve ark.İntrakranial Dev Anevrizmalar:İki Olgu Sunumu.Türk Nöroşirürji Dergisi 2006;16:183-7. 24. İnci S:Dev anevrizmalar.Temel Nöroşirürji(ed),Kranial vasküler hastalıklar,cilt 1,birinci baskı,Ankara:Türk Nöroşirürji Derneği Yayınları 495-500,2005. 25. Siablis D,Karnabatidis D,Katsanos K,et al.Extracranial internal carotid artery aneurysms:Report of a ruptured case and review of the literature.Cardiovasc ıntervent Radiol 2004;27:397-401. 26. Bardakçı H,Akgül A,Babaroğlu S,Kaplan S,Beyazıt M.Ekstrakraniyal İnternal Karotis Arter Anevrizması;Olgu Sunumu.Damar Cer Derg 2006;15:49-52. 27. Faggioli G,Freyrie A,Stella A,et al.Extracranial internal carotid arter aneurysms:Result of a surgical series with long term follow up.J Vasc Surg 1996;23:579-95. 28. Tadanori K,Atsuyoshi O,Katsuyoshi ı,et al.Surgical treatment of atherosclerotic and dysplastic aneurysm of the extracranial internal carotid artery.Ann Thorac Cardiovasc Surg 2002;8:183-7. 29. Zwolak RM,Whitehouse WMJr,Knake JE,et al.Atherosclerotic extracranial carotid artery aneurysms.J Vasc Surg 1984;1:415-22.